Today is our 'return to flight' day after the annual maintenance. Eureka took to the air an hour or so ago after all the engine run up tests were completed. 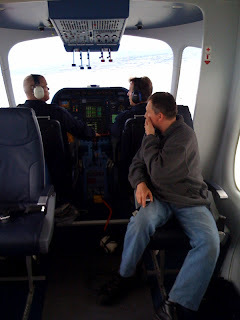 Our chief engineer, Matthew, just sent me this from his iphone... Fritz in the left seat, Jim in the right. Yay!